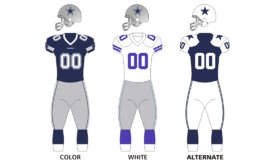 The 2006 Dallas Cowboys season was the 47th season for the team in the National Football League. The season began with the team trying to improve on their 9–7 record in 2005. The base offense was changed to a 2-TE formation. Several high-profile free agents were signed including controversial wide receiver Terrell Owens and kicker Mike Vanderjagt. Veteran defensive end Greg Ellis was also converted into a linebacker. Although veteran Drew Bledsoe was the initial starter at quarterback, fourth-year backup Tony Romo replaced Bledsoe at half-time of their week 7 matchup with the Giants. Romo became the starter in week 8 due to Bledsoe's rough starts with frequent sacks and interceptions. Romo initially played very well, going 5–1 in his first six NFL starts, including a win over the previously unbeaten Indianapolis Colts, but finished the season 1–3 with six TDs, six interceptions and two fumbles lost. The Cowboys secured a playoff berth for the first time since 2003, but did not win the division when in the final week they were defeated by the then 2–13 Lions, and wound up losing their first week in the playoffs to the Seattle Seahawks, a game in which Romo botched the hold on a go-ahead field goal inside the final two minutes. When Romo started the Thanksgiving Day game against Tampa Bay, it marked the 7th different starting Cowboys quarterback in the last 7 Thanksgiving Day games (Troy Aikman, Ryan Leaf, Chad Hutchison, Quincy Carter, Drew Henson, Drew Bledsoe and Romo). During the 2006 offseason, the team signed several high-profile players, including kicker Mike Vanderjagt, linebacker Akin Ayodele, offensive linemen Jason Fabini and Kyle Kosier, safety Marcus Coleman, and highly controversial wide receiver Terrell Owens, who has developed a reputation for causing conflicts with teammates, coaches, opposing players, and fans. The signing of Terrell Owens received a lot of media attention, and was arguably the biggest news story during the NFL offseason. Vanderjagt had the highest field goal percentage in NFL history coming into the season and his signing was expected to solve the inconsistency problems in the Cowboys kicking game. However, Vanderjagt missed most of the pre-season with an injury and missed three very short kicks (including an extra point) in the final pre-season game (which ended in a tie). 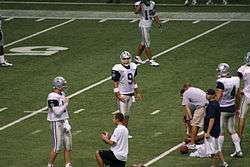 The Cowboys also lost veteran leadership in the locker room after losing tight end Dan Campbell to the Detroit Lions, wide receiver Keyshawn Johnson to the Carolina Panthers, left guard Larry Allen to the San Francisco 49ers, defensive tackle La'Roi Glover to the St. Louis Rams, and linebacker Dat Nguyen to a career-ending injury. The team didn't receive much help from the 2006 NFL draft, but experienced much more success with that year's rookie undrafted free agents: Miles Austin, Stephen Bowen, Sam Hurd and Oliver Hoyte. Abram Elam who was an undrafted free agent with the Miami Dolphins in 2005 and was out of football after being released in training camp that year, also contributed in special teams and in some defensive packages. Before the season, there was high expectations for the Dallas Cowboys. Sports Illustrated writer Peter King went as far to predict the Dallas Cowboys would win Super Bowl XLI. The Cowboys traded their original second-round selection to the New York Jets in exchange for second, sixth and seventh-round selections. The Cowboys traded their original third-round selection to the Jacksonville Jaguars for third and fourth-round selections. The Cowboys traded their 2005 fifth-round selection and original fourth-round selection to the Philadelphia Eagles for a 2005 fourth-round selection and a sixth-round selection. The Cowboys traded their original fifth-round and sixth-round (acquired from New York Jets) selections to the Jets in exchange for a fifth-round selection. The Cowboys traded their original sixth-round selection to the Kansas City Chiefs in exchange for linebacker Scott Fujita and a conditional 2007 selection (not exercised). Skyler Green was converted from wide receiver to running back. In the game, Terrell Owens broke his finger. With the win, the Cowboys went into their bye week at 1–1. During the game, Tennessee Titans linebacker Albert Haynesworth stomped on Dallas Cowboys center Andre Gurode. Haynesworth was suspended for five games without pay. . Later during the week, Terrell Owens accidentally overdosed on painkillers causing a media circus, but recovered within a day. Hoping to rebound from their road loss to the Eagles, the Cowboys returned home for a Week 6 battle against their in-state rival, the Houston Texans. In the first quarter, Dallas trailed early when Kris Brown kicked a 19-yard field goal for an early Houston 3–0 lead. 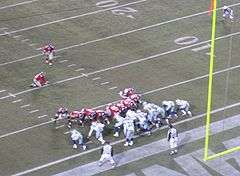 In the second quarter, the Cowboys tied the game at 3–3 when Mike Vanderjagt kicked a 22-yard field goal. At the end of the first half, Houston regained the lead when Brown kicked a 48-yard field goal. For the rest of the game, the Dallas defense shut out the Houston Texans. Drew Bledsoe and Terrell Owens hooked up on two touchdown passes, and Marion Barber ran a 1-yard touchdown, Vanderjagt kicked another 21-yard field goal, and backup quarterback Tony Romo threw another touchdown pass to Owens. Tony Romo completed his first two NFL passes, including one touchdown. With the win, the Cowboys improved to 3–2. Hoping to build on their win over the Houston Texans, the Cowboys stayed at home for a Monday Night match-up with their NFC East rival, the New York Giants. On the Giants opening drive, Eli Manning threw a 50-yard touchdown to Plaxico Burress. Later in the first quarter after Jeff Feagles punted inside the one-yard line, LaVar Arrington sacked Drew Bledsoe in the endzone for a safety. In the second quarter, Giants kicker Jay Feely kicked a 31-yard field goal. Dallas would score before halftime as Bledsoe ran 1-yard touchdown on a quarterback sneak. Bledsoe also threw a costly interception just before halftime that would have given the Cowboys a 14–12 lead at the break. Due to Bledsoe's abysmal performance, head coach Bill Parcells replaced him with backup quarterback Tony Romo at the start of the second half. Not much had changed for the Giants in the third quarter as Manning threw a 13-yard touchdown pass to Jeremy Shockey and Brandon Jacobs got a 3-yard touchdown run. In the fourth quarter, the Romo completed an 8-yard TD pass to WR Terrell Owens, and Romo ran into the endzone for a two-point conversion. The Giants pulled away as Feely kicked a 32-yard field goal, while rookie cornerback Kevin Dockery would return an interception 96 yards for a touchdown. Even though Romo threw a 53-yard touchdown to Patrick Crayton, the damage had already been done. With the loss, the Cowboys fell to 3–3. Six days after losing at home, Tony Romo made his first NFL regular season start against the Carolina Panthers, and he threw for 270 yards, a touchdown, and an interception. In the first quarter, the Panthers scored 14 points when DeShaun Foster, and later Steve Smith ran a touchdown, but those were the last points that Dallas allowed in the game. In the second quarter, Jason Witten caught a touchdown pass and Mike Vanderjagt kicked a field goal. In the fourth quarter, Dallas scored a franchise record 25 points on a Julius Jones run, two Marion Barber runs, another Mike Vanderjagt field goal, two extra points and a two-point conversion caught by Terrell Owens. Terrell Owens had his first 100+ yard game with 107 receiving yards. Julius Jones ran 92 yards for 616 yards in 7 games to start the season. Steve Smith was held to only 55 receiving yards and former Cowboys receiver Keyshawn Johnson only had one catch for 19 yards. The game marked unusual emotion from Bill Parcells, who was moved by the appearance of his former Giants players (such as Jim Burt) and who embraced many of his players late in the game. With the win, the Cowboys improved to 4–3. The Cowboys bounced back from a painful loss by beating the Cardinals, who came into the game with the league's worst record at 1–7. Tony Romo passed for 308 yards in his best game to date as a starter. Greg Ellis was also lost for the year in this game due to a torn achilles, costing the Cowboys a key contributor and one of only 2 players who could consistently rush the passer. In what Cowboys Owner Jerry Jones said was the best win in at least eight to ten years, the Cowboys beat the previously undefeated Colts 21–14. The game was nationally televised on CBS, having been moved from 1:00pm to 4:15pm (EST) because of the NFL's new "flex scheduling" policy. It was the first game played between the two teams at Texas Stadium in ten years. With the rest of the NFC East losing that weekend, the Cowboys were tied with the New York Giants for first place in the NFC East, and in a tie for second place in the NFC. The Cowboys chances of winning the division, and possibly a first-round bye in the playoffs were suddenly much brighter, especially with the rival Philadelphia Eagles losing Donovan McNabb for the season. With the win, the Cowboys improved to 6–4. On 27 November 2006, the Cowboys cut kicker Mike Vanderjagt and signed veteran Martin Gramatica in his place. Vanderjagt had made only 13 of 18 field goals in the season, well below his career average. With the win, the Cowboys improved to 7–4. The Cowboys extended their winning streak to four straight wins in a close game when newly signed place kicker Martin Gramatica kicked a 46-yard field goal with one second remaining. The Giants lost their fourth straight game and the Cowboys secured a two-game lead over the Giants. With the win, the Cowboys improved to 8–4. This game was moved from the originally scheduled time at 1:00pm to 4:15pm (EST) because of the NFL's new "flex scheduling" policy. On November 27, the NFL announced that the game was moved to 8:15 p.m. EST (7:15 p.m. CST) to be nationally televised on NBC Sunday Night Football. New Orleans Head Coach and former Dallas Offensive Coordinator, as well as Passing Coordinator, Sean Payton thoroughly dissected the Cowboys defense by showcasing the talents of Drew Brees, Reggie Bush, and Deuce McAllister. Perhaps more surprising was the performance of Mike Karney. Previously an unknown fullback who had never had a touchdown in his 43 NFL games, Karney scored a hat trick (three touchdowns). Brees topped 4,000 season passing yards for the first time in his career, having 26 completions for 38 attempts and 384 yards and five touchdowns. Deuce McCallister and Reggie Bush both proved their worth with 135 and 162 all-purpose yards, respectively. Payton was even feeling so confident as to attempt an onside kick early in the third quarter, further demoralizing the Cowboys and increasing momentum for the Saints when they recovered it. With 3 minutes left in the game and the ball deep in Cowboys territory, Payton's Saints went to kneeling, either to let Parcells keep some of his pride intact, or to make a statement. The Cowboys had one of the worst games of their season. Payton's defense never gave them a chance to get into a rhythm, and Tony Romo threw for 16 completions of 33 attempts for 249 yards for a single touchdown and a pair of interceptions. The Cowboys started out promising, stopping the Saints' offense and Julius Jones responding with a career record 77-yard touchdown run. Though after that play, nothing seemed to go right. Gramatica missed another crucial field goal, soaring wide right, and the only other touchdown came from a fourth-down pass to Terrell Owens that could have been an interception had cornerback Fred Thomas not had a cast on his hand. The Cowboys secured a playoff berth after the Minnesota Vikings lost to the New York Jets and the Carolina Panthers lost to the Pittsburgh Steelers. Their season ended after a 21–20 loss. With the loss, Dallas ended its season with three-straight losses and an overall record of 9–8. The Cowboys have had nine starting quarterbacks since Troy Aikman retired in 2000. They are Quincy Carter(started 32 games), Vinny Testaverde(started 15), the other games have been started by Ryan Leaf(3), Anthony Wright(3), Clint Stoerner(2 games), Chad Hutchinson(9), Drew Henson(1 game), Drew Bledsoe (22), and now Tony Romo is starting. The Cowboys had not had an 1,000-yard rusher since Emmitt Smith had 1,021 yards in 2001. Herschel Walker was the last running back before Smith to rush for over 1,000 yards in 1988. Julius Jones snapped that streak of futility for Dallas by posting 1,084 yards in 2006. In the previous season, Jones fell just short of the mark (993). DeMarcus Ware had 11.5 sacks in 2006, the most in team history by a linebacker. He broke that record in 2007 with 14 sacks, and then he broke it again in 2008 with a league-leading 20. ↑ "2006 NFL Draft Pick Transactions". ProSportsTransactions.com.